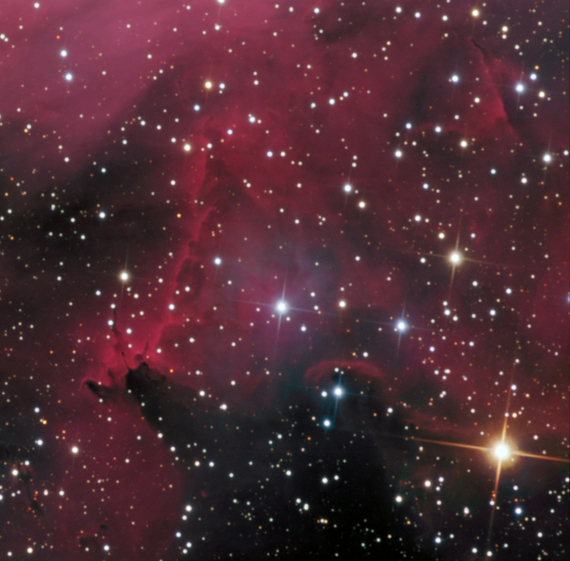 This nebula is near the "Running Chicken" nebula (IC 2948) in Centaurus. We have called it the "Snail" nebula for obvious reasons, however Kevin Jardine points out that the correct nomenclature is SFO 69. The area displays intense HII activity and contains not only HII clouds and several emission fronts but also a nice blue reflection nebula. Of special interest is the "head" of the snail that appears to us to display EGGs (Evaporating Gaseous Globules) similar to those shown on the HST image of M16 which are postulated to be a site of star formation. These EGGs are dense regions of molecular hydrogen that fragment and collapse during star formation. As star formation procedes more of the "head" will evaporate and collapse down to reveal additional EGGs. This structure was found by navigating to an interesting area in a widefield image taken by Johannes Schendler near Thackery's Globules (IC 2944). A refection nebula caught our eye and with some work we were able to determine the location of this area and image it. If you would like to do the same, slew to HD 308935 which is the star in the center of our image. To our surprise our initial Ha image provided much more structure than we anticipated.